Daniel M. Rice is the President and Chief Executive Officer of the Ohio & Erie Canalway Coalition, headquartered in Akron, Ohio. From his bio, "...Since 1994, Mr. Rice has worked with over 100 community partnerships and raised over $25 million in development funds for the preservation of historic structures, the development of the 101-mile multi-use Ohio & Erie Canal Towpath Trail and the conservation of natural resources along the Ohio & Erie National Heritage Canalway." He was kind enough to take some time from his busy schedule to answer some questions for us. Ohio Bikeways: For those not familiar with you or your work, tell us a little about yourself and how you became involved with the Ohio & Erie Canalway Coalition. Dan Rice: I have been with the Ohio & Erie Canalway Coalition since 1994. Our organization promotes the interpretation, development and conservation of the natural, historical and recreational resources along the Ohio & Erie Canal. We work with over 150 public/private partners on a variety of regional resource conservation projects including the popular 101-mile Towpath Trail, 110-mile Scenic Byway, implementation of the Summit County Trail and Greenway Plan and the Tuscarawas County Trail and Greenspace Plan. Through our community collaborations, we have developed 82 of the 101 miles of the Towpath Trail and stimulated over $300,000,000 of community and economic development along the Ohio & Erie Canalway from Cleveland to New Philadelphia, Ohio. My involvement with the organization started as a volunteer Board member in 1990, and when the organization decided to hire professional staff, I became the first employee in 1994, and I have been with the organization since then. Currently, we have 4 full time and 1 part time employee. Some of our recent projects include the restoration of the Richard Howe House, the former home of the Engineer of the Ohio & Erie Canal, in downtown Akron, restoration of the Limbach Buildings in the Village of Clinton and the purchase of canal lands in Tuscarawas County. OB: Do you cycle? If so, are you a roadie or trail rider? Rice: I ride on both the roads and trails. However, I prefer to ride on trails. OB: What's your preferred method of travel along the towpath? Rice: I enjoy hiking and bicycling on the Towpath Trail. Both modes of transportation are great ways to experience the unique natural and historical resources of this outstanding regional legacy project. OB: Finishing the northern end of the towpath is a complex puzzle that’s slowly being pieced together over many years. Is the picture any clearer today as to exactly where the trail will go and end, and when that might happen? Rice: Yes, the route of the Ohio & Erie Canal Towpath Trail from Harvard Avenue to Canal Basin Park is defined, and the local partners are working on the final design and development of this important linkage. One of the great challenges of developing the Towpath Trail in our urban areas is that the original canal resources are gone, and we need to define a route through an industrial and urban landscape. We are very fortunate that our local partners, including the City of Cleveland, Cuyahoga County government, Cuyahoga County Engineer, Cleveland MetroParks and Ohio Canal Corridor are working hard to complete this important and critical linkage. OB: Can you hazard a guess at this point as to when the towpath might be completed in Cleveland? Rice: The goal is to have the Towpath Trail completed by 2020. OB: Summit and Stark Counties expect to complete the trail within their jurisdictions soon. This will essentially complete the trail with the exceptions of both ends, north and south. What other progress can trail users look forward to in the next few years? 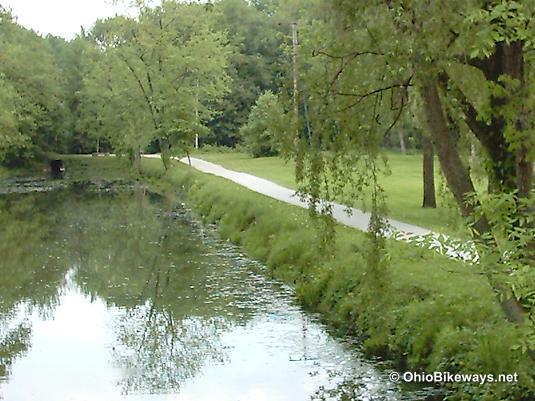 Rice: Through the leadership of the City of Akron, Metro Parks, Serving Summit County, and Summit County Government, the Ohio & Erie Canal Towpath Trail will be completed through the City of Akron and the City of Barberton by 2012. Currently, construction is underway on these critical sections. We are working with our partners in Tuscarawas County and we recently submitted a grant application to the State of Ohio for development of the Towpath Trail between Zoar and State Route 800. With the continued support from the Tuscarawas County Commissioners, Tuscarawas County Park Advisory Committee, City of Dover and City of New Philadelphia, our shared goal is to complete the Ohio & Erie Canal Towpath Trail in Tuscarawas County by 2020. OB: News regarding the Bolivar trail section has been hard to come by. There have been reports that the trail will be routed through town, so local businesses can take advantage of the tourism factor. Can you shed light on how much of the original towpath route will be used in the Bolivar area? Rice: Yes, you are correct. Our local partners in the Village of Bolivar decided to develop the route of the Ohio & Erie Canal Towpath Trail through the downtown business area so trail users will be able to take advantage of these trail amenities. The original prism of the Ohio & Erie Canal and Towpath Trail is visible and some sections of the historic resource remain between Interstate 77 and the Village. The route of the Towpath Trail will parallel this historic resource and connect to Fort Laurens, where the Towpath Trail connects to the Village of Zoar. OB: Is there a definitive southern endpoint for the towpath trail at this time? Or is it a matter of whether communities further down the line show an interest in being a part of the project? Rice: Yes, the current southern terminus of the Ohio & Erie Canal Towpath Trail is Waterworks Park in the City of New Philadelphia. We would like to get to Lock 13 and the turning basin on the south side of State Route 250, since that is a historic resource. For the time being, we will utilize an existing recreational resource in the City of New Philadelphia, which is an excellent trailhead for the Ohio & Erie Canal Towpath Trail. FIRSTMERIT Towpath Trail Century Ride, May 14-15, 2011. A group of bicycle riders will ride the entire length of the Towpath Trail to raise much needed funds for the development of the Towpath Trail. Cargill Canal Clean Up, May 6th. Join Cargill employees as we clean up the banks of the Ohio & Erie Canal and along the Towpath Trail. For more information, please visit our website at www.ohioeriecanal.org. OB: For those that may wish to make a donation to the towpath project, what's a simple way for them to do so? Rice: Individuals can visit our website, ohioeriecanal.org and make a contribution to our organization via Paypal, join us as a member and receive our quarterly newsletter, invitations to our events and receive our bi-weekly e-newsletter. For more information about our organization, please call us at (330) 374-5657. OB: I appreciate your taking time for this interview. Thank you. Rice: Thank you and take care.